Not much is better than a warm bowl of homemade pasta. It is our go-to meal when we are cooking for two or for a group of friends. It is always easy to build upon and add simple elements to create a full feast. Serve a smoked cheese, roasted olives, bread, butter, and one of these beauties and your guests will rejoice. We also encourage you to have guests roll out their own dough—it will only add to the party. For the pasta dough: Put the "00" flour on a clean work surface and form it into a mound. Using your hands, make a wide well in the center. Put the eggs, egg yolks, olive oil, and salt in the well. Using a fork, lightly beat the eggs and then slowly incorporate the flour into the wet ingredients, starting with the inner edges and working outward, until a shaggy dough forms. Using your hands, knead the dough until it is completely smooth and elastic, 10 to 15 minutes. If you find the dough to be sticky or too dry, add a sprinkle of flour or water as necessary while kneading. Wrap the dough in plastic wrap and let rest at room temperature for 30 minutes. To cut and cook the pasta: follow the instructions on page 120. For the sauce: In a large skillet, melt the butter over medium heat. Add the tomato confit and juices. Use a wooden spoon to break up the tomatoes to create a chunky sauce and let simmer for 5 minutes. Add the cream and allow it to reduce slightly, about 5 minutes more. Stir in the reserved pasta water and add the cooked pasta. Toss to combine. Taste and season with flaky salt as desired. 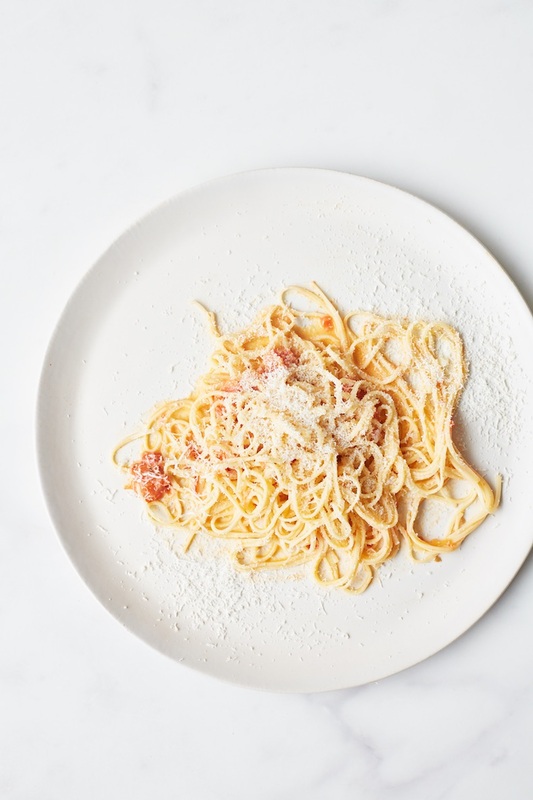 To serve, place the pasta on individual plates and top each with Parmesan.